PORTLAND, Ore. (AP) Even Cleveland’s late rally couldn’t rattle the confident Trail Blazers. Lillard added 24 points for the Blazers, on their longest run since also winning 11 in a row in 2013. It was the Blazers’ eighth straight win at home. LeBron James had 35 points, including a highlight-reel dunk in the first quarter that had the fans at the Moda Center momentarily stunned. He also had 14 rebounds. Kyle Korver added 19 points. The Blazers, currently sitting in third in the Western Conference standings, led by as many as 15 points in the third quarter. 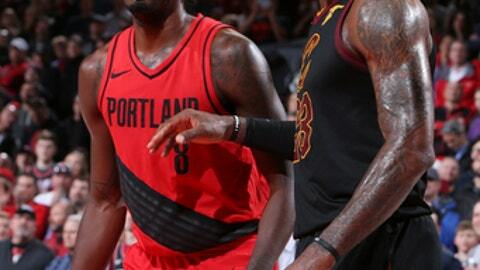 Portland kept the margin at double digits well into the final period, but James and George Hill made layups to get the Cavaliers within 105-99 with 3:25 to go. Hill’s 3-pointer pulled Cleveland within three points but Al-Farouq Aminu answered with a 3 and Evan Turner added a jumper to hold off Cleveland’s rally. Jordan Clarkson’s 3-pointer made it 110-105 with 1:34 left, but James missed a layup with 33 seconds to go and Lillard made three free throws to seal it. The Cavaliers, third in the East, didn’t have Larry Nance Jr. because of a hamstring injury he sustained early in the third quarter of Cleveland’s 129-107 victory over the Suns on Tuesday. Tristan Thompson missed his sixth game with a right ankle sprain. Kevin Love, who grew up in nearby Lake Oswego, missed his ninth game with a left hand fracture. Love could return to the Cavaliers as early as next week. ”We just need to continue to keep building. We’ve got a lot of injuries, a lot of guys down, so we’ve just got to have that next man up mentality,” Cleveland coach Tyronn Lue said. Lillard, the reigning conference player of the week, made his first attempt of the game, a 3-pointer. But the highlight of the first quarter was easily James’ monster dunk over Jusuf Nurkic that pulled Cleveland in front 15-14. McCollum’s 3-pointer gave the Blazers their largest lead of the half, 55-46. James made a turnaround jumper at the buzzer to pull Cleveland to 59-54 at the break. McCollum hit consecutive 3-pointers and Lillard made another that stretched Portland’s lead to 81-66 midway through the third quarter. Cavaliers: James became the sixth active player with 400 double-doubles. … It was the fifth game of a six-game road trip for the Cavs. Trail Blazers: Lillard went 0 for 5 from 3-point range in the first half, but he led all players with five assists. … With nine assists, Lillard became the third player in league history have 1,500-plus points and 400-plus rebounds in each of his first six seasons. … The Blazers have won five straight against the Cavs at the Moda Center. James was asked at shootaround earlier in the day if Lillard was unappreciated. ”Give me Damian Lillard. I’ll show you how appreciated he’d be,” he said. Cavaliers: Conclude their road trip on Saturday against the Bulls. Trail Blazers: Host Detroit on Saturday.